Updated: the “News Sort : Most Recent” option to also clear the “POSTS YOU HAVEN’T SEEN” section at the top of your friend’s Timeline pages, so it shows their Most Recent Posts at the top, as you would expect. Fixed: the “Friends Feed” option which had stopped working, and also fixed the constant refreshing that could occur if that option was selected. 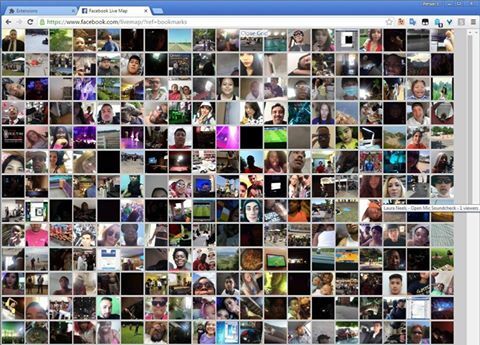 New: I’ve added a “View Live Grid” Link at the top of the Live Video Map page, gives you a grid based view of current Live Users. 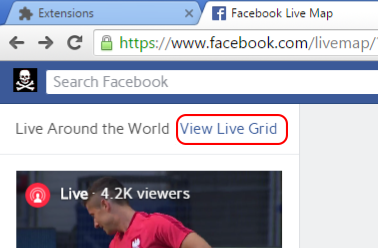 Known issue with the live grid, for users of the Firefox extension version of FBP if you click one of the images in the live grid in firefox, it opens the video in a new tab, FBP will not be active in the new tab, and you will need to refresh the page to activate FBP in that tab. A solution to this, is to use the GM Script version of FBP instead of the extension version, as that issue does not occur with that version. The GM Script version of FBP is on the same Install page as the extension version. New: “Enlarge Reaction Images” Option, under the “Custom Reactions” heading. I’ve also made it easier to select the existing Custom Reactions from the Custom Reactions page. Hovering over the example URLs on that page will display a preview of what the reaction images look like and clicking on a URL will select the URL, you then just need to right click and copy and paste it into the Custom Reactions box on the FBP Options screen. Updated: If you tick the “Hide Nagging Questions” option (under the Timeline Options heading on the FBP options screen) it should also now get rid of those Facebook Greetings you get under the Status box on the Newsfeed page. Install / Update the latest version of FB Purity by clicking the green “Install FB Purity” button on the FB Purity Install Page. Please note Chrome users can try updating the extension by going to the Chrome Extensions management page then ticking the “Developer Options” box, then clicking the “Update Extensions Now” button. 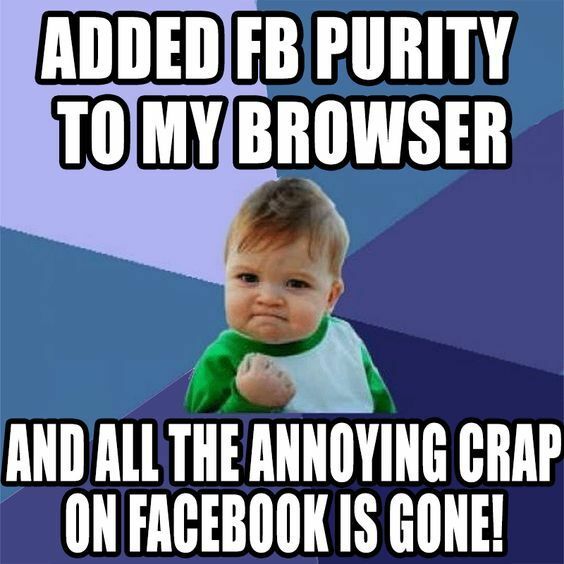 For those who don’t already know, FB Purity is a safe, free and top rated web browser extension for Google Chrome, Firefox, Safari, Opera and Maxthon. It lets you clean up the junk and customize Facebook the way you want it to be. It has many cool features, such as hiding all the ads, alerting you when friends un-friend you, letting you change the site’s colours, fonts and background image, it lets you stay on the “Most Recent” feed permanently and lots more. FBP has been reviewed and highly recommended in many places including the Washington Post, CNET, PCWorld, MacWorld, GetConnected etc. This entry was posted in Facebook, FB Purity and tagged clean up facebook, customise facebook, Customize Facebook, enlarge custom reactions, Facebook, facebook live, facebook live grid, facebook live user grid, facebook live video, facebook purity, FB, FB Purity, FB Purity Update, FBP Update, fluff busting purity, hide facebook junk, hide your posts, larger custom reaction images, live video grid, newsfeed filter, posts you havent seen, sort most recent, sort timeline by most recent, view live grid. Bookmark the permalink. The “Posts You Haven’t Seen” has returned to all friends’ pages and Purity won’t shut it offr anymore. This was the main reason I got and donated to FBP, although I LOVE all the other features. I hope this bug is fixed; it is annoying to have tob refresh every friend page I visit. Thanks.